**“Warner Bros. provided me with a Nancy Drew swag pack to facilitate this post. The opinions I share are my own.”** I’m going to show my age here, but when I was a kid I enjoyed watching Nancy Drew and the Hardy boys (1977) series with Shaun Cassidy, Parker Stevenson, and Pamela Sue Martin. Guess they are the reason I like mysteries. I have to find time to go see Nancy Drew and the Hidden Staircase. 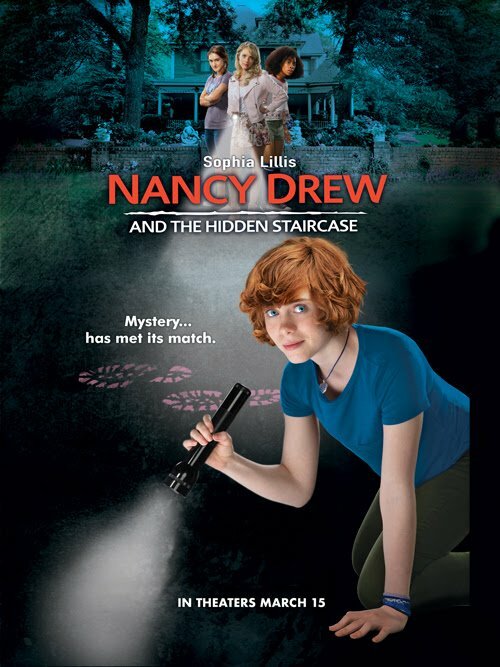 Nancy Drew and the Hidden Staircase is an all-new film released to theaters on March 15 from Warner Bros., Ellen DeGeneres’ A Very Good Production and Red 56. The iconic mystery solving teenager from the classic Nancy Drew books is back with an all-new feature-length film that will keep you guessing until the very end! After the death of his wife, Carson Drew decides to leave Chicago behind and make a fresh start with his daughter 16-year-old daughter Nancy in River Heights. Nancy is asked by Flora to help solve the ghostly activity at her home, the Twin Elms mansion. Can she help explain the creaking footsteps, exploding light bulbs and the ominous creature? Is it the handiwork of high-school bully Derek Barnes? Or is it possible that the ghost of original owner Malcolm Colfax is back for revenge? Recruiting her best friends George and Bess, along with local “mean girl” Helen, Nancy Drew is on the case! And… we have a great new Mystery Swag Pack Giveaway for you! Check out the Nancy Drew and the Hidden Staircase Escape Room & Mystery Match Blog App! * One winner will receive a Nancy Drew Swag Pack. Open to US residents only. Must be 18+ to enter. Winner will be notified via email with 24 hours to respond or a new winner will be selected. No P.O. Boxes, because the package will be sent via FedEx or USPS. If you or a member of your household have already won this prize on a blog giveaway you are ineligible to win again. Sponsor is responsible for verification and prize fulfillment. Giveaway runs 03/18/19 – 03/26 at 11:59 PM CST* Good Luck! I really liked the mirror clue in the app. That was fun! I liked the candle clue. My favorite clue was Drop me I’m sure to crack, look at me and I’ll smile back. Favorite clue was the candlestick riddle.